I get numerous recommendations of podcasts to listen to, books to read, articles to comment on, videos to watch and where possible I do my best to note them down and work through them. It’s tough and I often feel guilty as the person giving me that information is usually doing so as they have genuinely seen a benefit in it for me. I like that, to me it shows that the person you are communication with actually cares about you. Back to the point, I was working my way through a podcast that had been recommended to me and in one of the episodes a fantastic discussion developed around the topic of coaching. The podcast in question is The Joe Rogan Experience and this particular episode featured John Danaher. Now I’m not a fan of MMA fighting or any other martial art really, so this isn’t a podcast I would usually default to but the discussions are fascinating. In this episode John Danaher explains how he was influenced in regards to a particular evolution in the discipline of Brazilian Jujitsu. He recalls how the most powerful influence in his career in Brazilian Jujitsu was from somebody who he had never coached or sparred with but from somebody who within a three minute interaction had given him a point of view. Danaher goes on to say "Give a man a point of view and you can influence him forever". I have my own experience of this working on me. I can vividly recall the moment my GCSE English teacher approached me to influence me to take up English Literature A Level. At the time I had no interest in doing that, not because I didn’t enjoy literature but because I had always found English quite difficult and as a result I didn’t think I was any good. All my mates weren’t going to be doing it and the subject didn’t really help me with what I wanted to do with my future. In short, my teacher had a job on his hands to convince me. I now have an A level in English Literature and whilst I never studied the subject any further I have developed a lifelong fondness for reading literature that I hope to pass on to my kids. I have those things because in a very short period of time (probably around two mins) my teacher had influenced my behaviour by presenting me with a point of view. His words to me were “ You don’t have to be good at English to appreciate English Literature”. It had a profound effect on me and provided me with a new perspective on the matter. 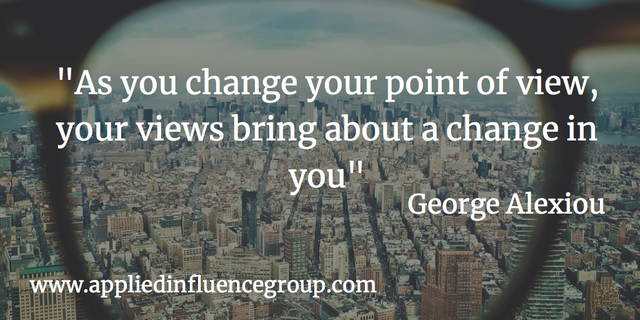 From an elite influence perspective, providing a point of view is a fantastic way of landing an influence message or starting the process of winning an argument. It’s subtle, long lasting and if the stakes are high can alleviate one of the most severe effects when influencing; the backfire effect. The backfire effect is the impact of calling somebody out on their incorrect position in an argument. The backfire effect happens when the inconsistency, error or ill-informed position is highlighted to an individual and instead of accepting the logical information to the contrary, the individual in question becomes even more resolute with their incorrect argument. Providing a point of view allows the recipient to form their own conclusion and alleviates the potential for the backfire effect to come into play. I echo John Danaher's position, if you can give someone a point of view, you can influence them forever.